GRAMMAR: expressing purpose, reason and result. How do you account for the fact that retired politicians in Spain receive such high salaries? Have you sometimes been completely thrown by english phrasal verbs? Are you determined to get your english up to scratch? What are the most interesting web sites you have come across recently? Are regional languages likely to die out in the near future in Spain? Which television series allow you to become more attuned to different english accents? What do you think is going on behind the scenes concerning the “Barcenas” case? Are you familiar with the expression to get down to work? Do you know anyone who has an excellent command of english? Do you have a lot in common with your colleagues at work? Who are the most highly articulate english speakers in the Spanish government? Tell us a situation when you were able to hold your own in conversation with native English speakers? Do you think there is little chance of economic growth anytime soon or are you more optimistic? What is the major negative factor affecting the spanish economy? Are some people finding it difficult to make ends meet these days? Are any of you naturally gifted musicians ? Do you find it easy to pick up expressions in English when travelling? Have you ever met anyone famous quite by chance? Are you settling well into your work routine ? Can learning a foreign language stand a person in good stead in the future? Will Barcelona footbal club sweep aside all contenders this season? Do you remember and were you taken by surprise when the twin towers in new york collapsed? Is your ability to conduct a conversation in English a bit rusty? Don´t you marvel at how much bankers pay themselves? Do you have more than a rudimentary knowledge of french? Do you think it is important to protect endangered languages? Why or why not? Do some people have innate ablities to learn languages? Are people becoming more indignant about the economic situation? Is it anathema for bankers to forgive debts? Are there any changes you would like to make in your life at present? Do you try to enjoy everything you do in life? Have you ever had a chance to work abroad? Does your job offer the opportunity to travel? What is the biggest step you have taken in your life? At what age would you prefer to retire? Do you use internet banking to make all your financial transactions? Do you pay for things by direct debit? Do you withdraw money from the bank regularly? Are you continually writing down new words? Have you ever followed a strict diet? What is the best way to travel if you want to enjoy the view? Do you use a trolley or a basket when shopping in a supermarket? Do you have a lot of things on your computer you never use? What topics do you enjoy discussing with friends? Which supermarket do you use to buy your groceries? Do you appreciate a wide range of music? Do you consider yourself to be an observant person? Have you seen any films that you would recommend to other people? Do you receive anti-virus updates regularly? Do you ever talk to yourself without realising it? Have you had lots of opportunity to use your english language skills? Expressing purpose reason and result. Purpose so (that) a clause between clauses He always dresses smartly so that people notice him. with the purpose of/ intention of verb + ing after main clause John left early with the purpose of / intention of returning. so as/in order to infinitive after main clause John runs in order to keep fit. In case/Otherwise a clause after main clauses Take your phone incase you need to call me. For this reason a sentence at the beginning of a sentence and referring to the previous one. Someone called. For this reason I was late for the meeting. Result Consequently/ as a consequence a sentence at the beginning of a sentence and referring to a previous one John injured himself in training yesterday. As a consequence, he will not be attending the meeting today. As a result a sentence as a consequence and as a result can also be used at the end of a sentence. John didn´t write a very good letter of application. He wasrejected as a result. Account for something (v) to give a reason for something. All the more (advp) even more. At something´s last gasp (pp) going to soon disappear. Be completely thrown (vp) to feel completely shocked or confused. Be up to scratch (vp) to be of good enough quality. Come across something/one (v) to discover someone or something by chance. Die out (v) to become rarer and then disappear completely. Get attuned to something (vp) to start to recognise or be able to understand something. Get behind the scenes (vp) to get beyond appearances and see things which most people don´t usually see. Get down to something (v) to start doing something seriously and with a lot of attention and effort. Get stuck into something (vp) to start doing something with energy and determination. Go about doing something (v) to start to do something in a purposeful way. Have an excellent command of something (vp) to have an excellent knowledge of a subject. Have something in common (vp) to share features, interests or experiences with someone. Highly articulate (adv+adj) able to express ideas and feelings very clearly in words. Hold your own (vp) to be as successful as other people in a situation. In other respects (pp) in other ways. Little chance of something (np) not much possibility of something. Major factor (adj+n) one of the main things that has an effect on a situation. Make a fool of yourself (vp) t behave in a way which is embarrassing and makes you look silly. Make ends meet (vp) to have just enough money for the things that you need to live on. Naturally gifted (adv+adj) able to do something very well because you were born with that ability. Pick up something (v) to start learning something or doing something without intending to. Press someone for something (vp) to try to persuade someone to do something. Quite by chance (advp) completely by accident. Settle into something (v) to start to feel relaxed and comfortable in a new situation. Stand someone in good stead (vp) to be useful to someone. Sweep something aside (v) to replace or desroy something. Take someome by surprise (vp) to surprise someone. Word for word (translate something) (adv) taking each word separately and in the same order. 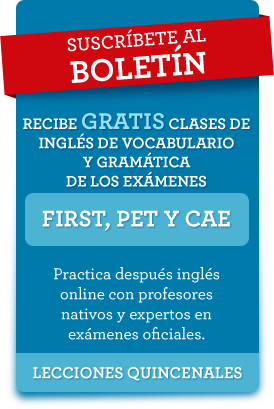 Esta entrada se publicó en Clases de inglés gratis, Lecciones ADVANCED gratis y está etiquetada con advanced, C1, grammar, inglés gratis en 26 noviembre, 2013 por admin.